The religious leaders who spent a lifetime studying God didn’t recognize Him when He stood right in front of their faces before Christ would die for our sins. It’s easy to view with a critical eye in hindsight. With a backward view, we see the full picture to the place we stand in the present. We see all the pieces fitting together that brought Jesus to where He stood the week of His crucifixion. Jesus didn’t come the way man expected. Jesus wasn’t the picture the people envisioned of the Messiah. They missed God because He didn’t meet their personal expectations. Father, let me not miss seeing You because You appear in a way I’ve not envisioned. Guard my heart and give sight to my eyes. How often do I attempt to define God’s ways? How often do I place expectations on Him? How often do I question circumstances that seem to move in the opposite direction I want them to go? Some of the ones crying out for a king wanted immediate relief from Roman rule. They couldn’t see eternally because they were so focused on the harsh brutality they walked in. While I can’t begin to imagine walking in the shoes of the people who lived when Jesus walked the earth, I can relate in how easily I place my focus on the here and now rather than eternity. When I watch my children hurting, I want to fix it right away. I want to take away the pain and make their worlds right. Jesus loves us with a love so pure, so holy, and so unconditional. Jesus tipped this world upside down in order to right it. The heart of God is love. A love so enormous it would go to an extreme no human mind could conjure up. A love so magnificent it would come in a way that seemed ridiculous. A baby in a manger. A man riding a donkey into the people who would nail Him to a cross within days. In our personal walks with the Lord, we become disheartened when we don’t see faster results to our prayers. We begin to wonder if our prayers are being heard. And if we are completely honest with ourselves, at times we convince ourselves we are trusting God, but our souls know better. Buried deeper in our hearts than we want to go, whispered lies from the enemy have found a secret hiding spot. They live in the dark places so they are hard to identify. They whisper in a low tone so as not to draw attention to themselves. When they surface, they retreat faster than they arose. I love that perspective. That question is full of trust and curiosity. It’s from a position of knowing the character of God and surrendering to His Lordship. Today, may we choose a deeper level of surrender than we’ve yet offered. May we surrender to the love of our King. May we allow the truth of who He is cleanse the infections attacking the affections of our hearts. May we humbly confess that we’ve attempted to define an undefinable God. We’ve expected Him to do a certain thing or appear in a certain way. Therefore, maybe we’ve at times missed Him while looking for the “Him” we created or imagined. May we receive new sight today to see truth in order to worship in spirit and in truth. May we quietly reflect this Holy Week on who God is by the light of His Word. 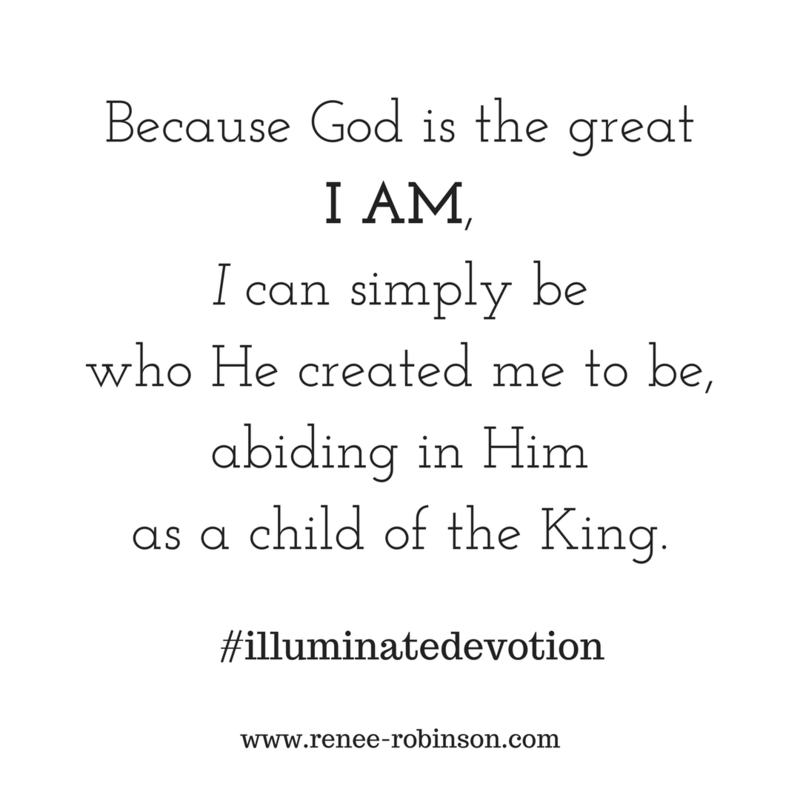 Because He is the great I Am, I can simply be who He created me to be, abiding in Him as a child of the King. Illuminate – Seeing God by the Light of His Word. It’s 10 minutes a day for 14 days. 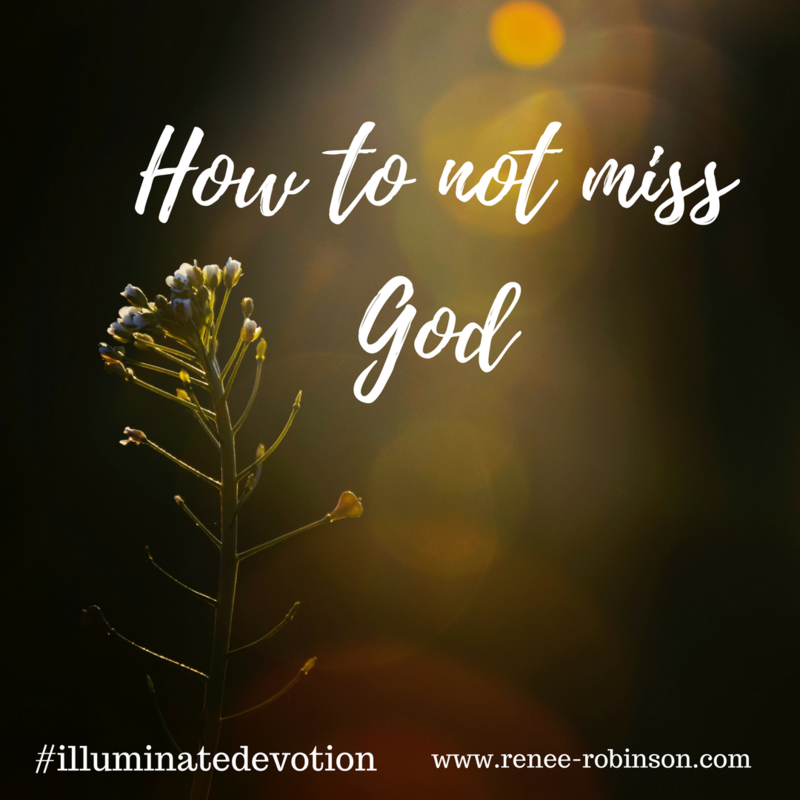 If you are hungry for deeper intimacy with God, Illuminate is for you. If you are tired of fear, anxiety, frustration, and pressures of life having their way in your heart, Illuminate is for you.